So many bloggers are doing amazing things to benefit the humanitarian missions in Haiti and I want to highlight some of my favorites. Elsie auctioned off a painting (now closed, but a great idea, nonetheless). The lovely ladies at Elle's Studio have compiled a huge collection of their goodies, including stamps, paper tags, recipe cards, and more. They are auctioning off a medium sized flat rate usps box with over 100 items from their shop and 100% of the proceeds will benefit World Vision. If you are in a position to help, my goodness, what a great way to do so! 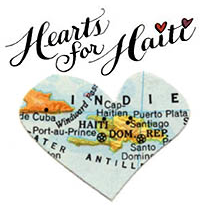 Hearts for Haiti is a collaboration of over 200 Etsy artists donating 100% of their proceeds to Doctors Without Borders. 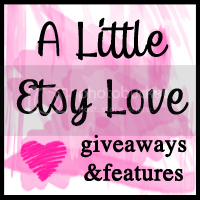 Here's a great roundup of Etsy shops donating their proceeds from Apartment Therapy. Rural Pearl, a shop I love and have bought from, is donating 100% of sales from 3 different prints. Bitsy Blossoms is donating 100% of sales through 1/22 to the relief efforts. That's a really nice idea. thanks for post Kate!